1942: (Stanley) Hiller Industries, Berkeley CA. 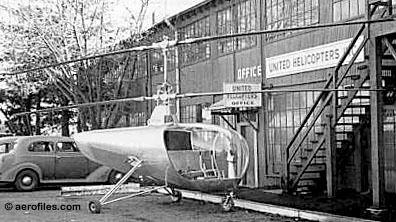 1944: United Helicopters Inc (Hiller & Henry J Kaiser), 625 El Camino Real, Palo Alto CA. 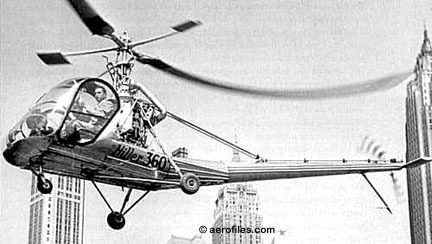 c.1952: Hiller Helicopters. 1961: Acquisition by Eltra Corp, a holding company. 1964: Fairchild-Hiller Corp. 1973: Hiller Aviation. 1984: Fairchild-Hiller assets sold to Rogerson Aircraft Corp as Rogerson-Hiller, Port Angeles WA. 1994: Hiller Aircraft Corp, Newark CA, established when Jeffrey Hiller (son of Stanley) led an investment consortium to repurchase the assets from Rogerson-Hiller Corp.
12E 19?? = 2pCH; 305hp Lycoming VO-540A; rotor: 35'0" length: 27'8" v: 95/87/0 range: 400. Army version H-23. 206 19?? = No data. 360 1949 = 2-3pO-CH; 178hp Franklin 6V4; rotor: 36'6" length: 37'10" load: 747# v: 105/85/0 range: 212. $19,995. First transcontinental helicopter flight, San Francisco-New York, in 1949. 1099 1961 = 6p prototype of a turbine-powered (P&W PT6) transport helicopter using dynamic components of earlier models with a new and larger fuselage. H-23, OH-23 Raven - Army version of 360. 2-4pCH; Franklin and Lycoming; rotor: 35'0"-35'5" length: 27'9". Redesignated OH-23 in mid-1962. YH-23 1950 = 2p prototype. POP: 1 [50-1254]. H-23A 1950 = 2p ambulance with two external side litters; 178hp Franklin O-335-4; load: 884# v: 84/76/0 ceiling: 13,200' range: 197. POP: 100 [51-3969/4018, -15966/15970, -16092/16141], of which 5 to USAF for trials. H-23B 1952 = 200hp O-335-4; skid/wheel gear; v: 82/78/0. POP: [51-16142/161414, 54-862/881, -2915/2949, -4009/4034]. Some later units repowered with 250hp Lycoming O-540. H-23C 1956 = Similar to UH-12C. 3p with one-piece canopy, metal rotor blades. 250hp Lycoming VO-540-23B; v: 82/78/0 range: 197. POP: 145 [55-4060, -4063/4131, 56-2245/2316, -4020/4021, 57-6521]. H-23D 1956 = Army basic trainer. 3p with VO-540-23B and improved rotor and transmission systems; v: 95/82/0; ff: 4/3/56. POP: 438 [55-4061/4062, 57-2982/3077, 58-5398/5505, et al]. H-23E - Reserved for planned 3p version of civil 12E, but unused. H-23F 1962 = 4p with 305hp Lycoming VO-540-A1B; load: 987# v: 96/90/0 range: 225 ceiling: 15.200'. POP: 22. H-23G 19?? = 3p dual-control version of H-23F; load: 1041#. POP: 793. H-32 Hornet 1951 = 2pCH; two 31# Hiller 8RJ2B ramjets. First certificated helicopter to use jet engines. As YH-32. HO-5, H-5 1961 = Military version of 206. POP: 5. Hornet 195? = 1pCH. No data. 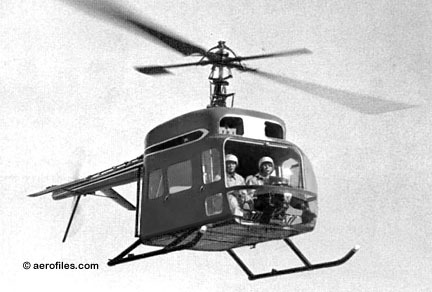 HJ-1 Hornet 1952 = 2pO-CH; two 31# Hiller 8RJ2B ramjets; rotor: 23'0" v: 80/69/0 range: 50. POP: ?? ; 12 to AF as YH-32, 3 to USN as HOE [138651/138653]. HTE - Military version of UH-12. HTE-1 1950 = Data similar to UH-12A. POP: 17 [125532, 128637/128652]. HTE-2 1951 = Data similar to UH-12B. POP: 35 [129757/129791]. J-5 1946 = 1pOH. 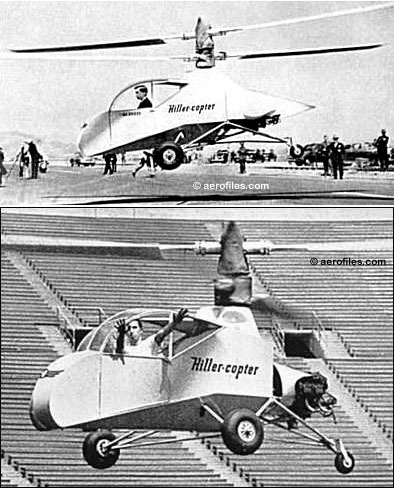 Hiller's first single-rotor craft; first helicopter to fly with torque-converted jet power. 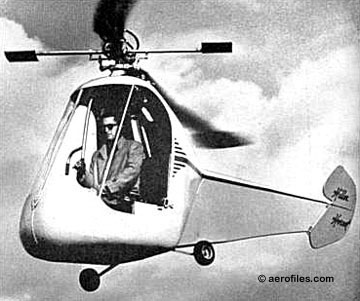 ROE Rotorcycle 1958 = One-man, open, foldable helicopter. 45hp Nelson H63B; rotor: 18'6" v: 70/52/0 range: 37-166. Empty wt: 300#. Experiment in battlefield transport for ground troops, with simplified control systems. Tripod base. Assembled from a kit by one person in less than 10 minutes. POP: 5 as XROE-1 for USMC, plus 10 for NATO evaluation, but was considered impractical. UH-4 Commuter 1946 = 2pCH; 125hp Lycoming O-290; rotor: 33'0" load: 480# v: 100/75/0 range: 200. Twin coaxial rotors; won the Grand Award at 1947 World Inventors' Congress. UH-5 1947 = 2pCH. Featured "Rotormatic Control," Hiller's servo-paddle method of cyclic control. UH-12 Raven - 3pCH; 175hp Franklin 6V4; rotor: 35'0" length: 26'6" load: 965# v: 84/76/0 range: 210 ceiling: 10,000' (data for UH-12A). First production Hiller, based on 360, primarily specific for the agricultural market. UH-12B 19?? = 200hp Franklin O-335-6; load: 932# v: 85/70/0 range: 135 ceiling: 9,400'. UH-12E3 1995 = 3pCH; 345hp Textron-Lycoming VO-540. [N101BX]. UH-12E3T = 3pCH; 420hp Allison 250. UH-12E5 1995 = 5pCH; 345hp Textron-Lycoming VO-540. [N501HA]. UH-12E5T = 5pCH; 420hp Allison 250. 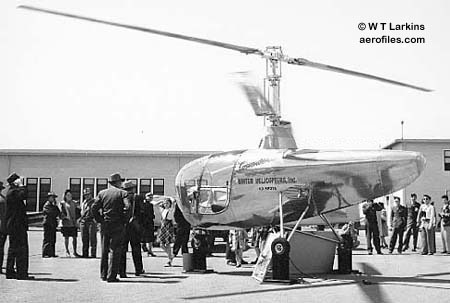 UH-44 (XH-44) Hillercopter 1944 = 1pOH; 90hp Franklin, replaced by 125hp Lycoming O-290. Stanley Hiller Jr. First successful coaxial rotor system. Prototype built in Hiller's garage in Berkeley; never having flown, he crashed on his first test flight in July 1944. Undaunted, he persisted and created a most succesful post-war aviation industry. Basic design evolved into X2-235 and, ultimately, 360. X-18 1959 = Tilt-wing VTOL rebuilt from Chase YC-122C; two 5850hp Allison turboprop T40A-14s from the abandoned Lockheed XFV-1 and Convair XFY-1 VTOL experiments + one Westinghouse J34-WE; span: 48'0" length: 63'0" v (est): 250. Six-blade contra-rotating props; J34 was installed in the aft fuselage to provide pitch control during vertical flight. POP: 1 [57-3078]; ff(as a conventional aircraft): 11/24/59 (p: George Bright, Bruce Jones). Test results were later employed in LTV-Ryan-Hiller XC-142A. 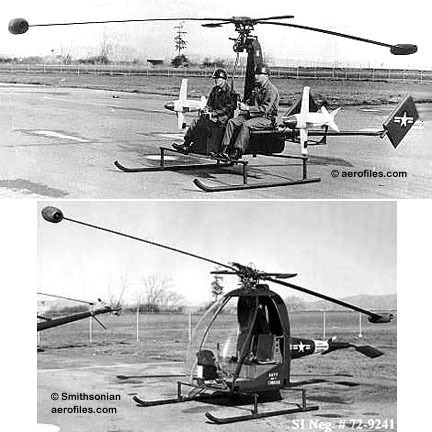 X2-235, UH-1 1945 = Metal 2pCH evolution of UH-44 with 235hp Lycoming and counterrotating rigid rotors. POP: 2, plus 1 unfinished ship procured by USN for wind tunnel tests at NACA, field designation as UH-1X. VZ-1 Pawnee (aka Flying Platform) 1955 = Evaluative production of a standing one-man aerial platform developed from a 1950 concept of Charles H Zimmerman (he called it his "Flying Shoes"). 5' fiberglass ring with two 40hp Nelson H-56 (three in the second and third ships), two coaxial counter-rotating props; diameter: 5'0" (6'0" in second prototype) v: 15; ff: 2/x/55. Planned use for combat troops as a "flying motorcycle." POP: 3 (the first prototype was not serialized) [56-6944/6945]. Project cancelled because of sluggish performance, a result of the Army's insistence on adding a third "back-up" engine, which also added needless weight. Interim USN designation of YHO-1E also assigned.